Protip for all you carebears out there: If you don't care about EVE, don't play it. Our Agents save orphans from burning buildings and it doesn't prevent them from obeying the Code. Why? Because our Agents are elite. Welcome to another edition of the Highsec Miner Grab Bag! Some of our best work is recorded by petitioners. 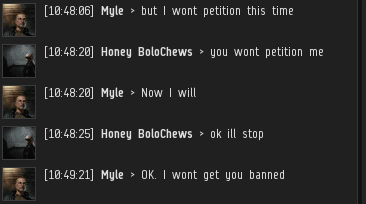 Myle went on to lose a 1.9 billion isk Golem. The bumper is still at large. 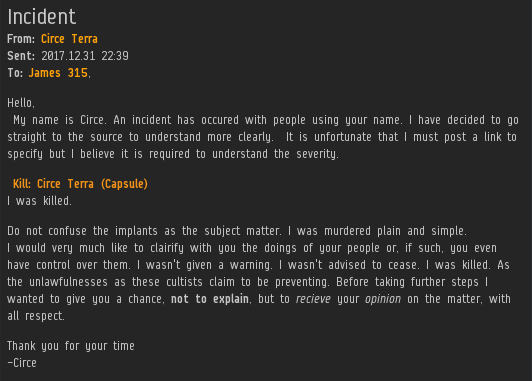 Circe Terra's EVEmail brings to mind an important point about miners who get ganked: They deserve it. For instance, Circe referred to our illustrious Code enforcers as "cultists". Another protip: If you're going to ask me for reimbursement (or for an opinion), don't leave the word "cultist" in your final draft! He couldn't maintain the facade for ten minutes. 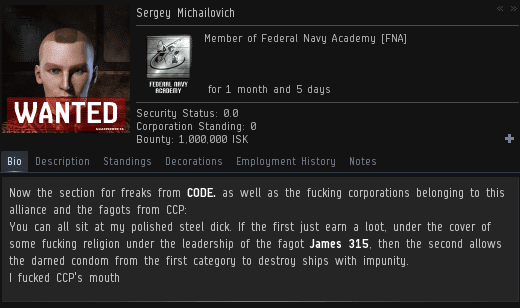 Character bios certainly got more interesting after the Code came to highsec. In nullsec, people add supercap pilots to their contact list. In highsec, they add Agents of the New Order. We're basically the supercapitals of highsec. After all these years, the carebears are still trying to understand what motivates us. Protip number three(! ): Here's a hint. For the carebear, every gank represents an opportunity. He can squander it by behaving like a bot-aspirant--or he can choose to rise above his carebear nature. So far, so good. But only time will tell. Miners, take note. 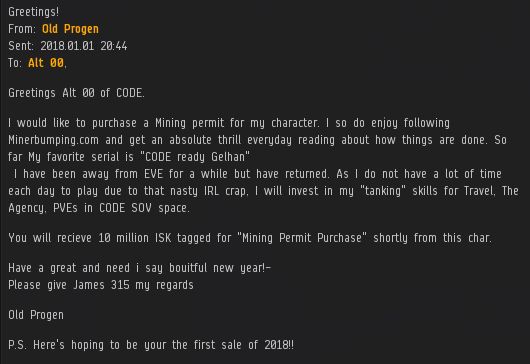 None of that "nobody warned me," or "I would've paid but now I won't," or "I mined every day for 8 years in Amarr space without a permit and never saw an Agent" nonsense. Just some respect and 10 million isk. That's how it's done. Miners say the dumbest things. But what of cause and effect? Does mining actually make them dumb, or are dumb pilots just naturally drawn to mining? The answer will shock you. It's both. Only The Code can interrupt this vicious cycle. Just remember those miners are elite, you cannot be an elite PvP'er without killing elite players. that comment makes absolutely no sense. that's like saying you cant be a professional baseball player because you play catch in the backyard with your son. Pro tip for all agents of murderloving.com, stop killing your kids. I've never seen an agent murder anyone. However in anti-ganking a person literally killed his kids, fiancee and himself. Maybe you just remembered wrong by mistake? Serghey's bio is lulzy, that's one mad carebear. Here's some more tears of impotent rage you may have missed, it's eve reddit's "best post of 2017."